Welcome Back to JenniTRX.ie with her Third Installment on Clean Eating, Here She give us Lot’s of Great reasons to do so, how to get started and what healthy swaps we can make :)! So why do I eat clean? To remove as many chemicals and toxins from my body as possible. The end goal for me is not to loose weight but to become a much healthier version of me. When I eat well I feel like my skin glows and I feel generally well from the top of my head to the tips of my toes inside and out. 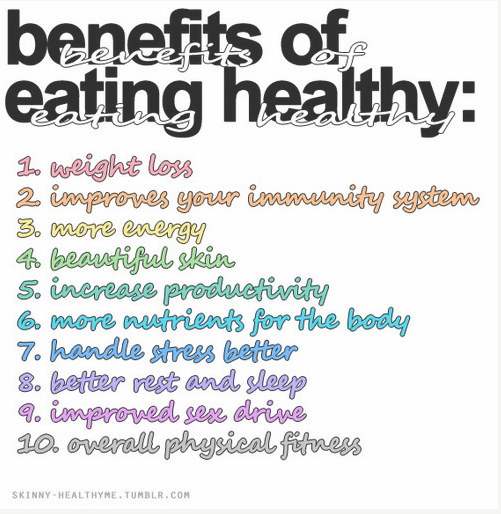 The list of health related benefits that come as a result of following a clean eating lifestyle are vast and I don’t think I would be able to cope with my hectic stress filled life at the moment if I wasn’t eating well. – A positive side effect of a healthy diet will naturally be weight loss, although it’s not the main reason for me choosing this lifestyle. – It helps me build a strong immune system to help fight coughs and colds throughout the year. It also helps me build a strong foundation to fight the possibility of developing some of most widespread illness and diseases sweeping across Ireland such as Diabetes, Heart Disease, high blood pressure, High Cholesterol, and cancer all of which are unfortunately in my own family. I try not to take antibiotics if I don’t need them and always try a Natural remedy first. – Eating unprocessed food means I get more nutrients from my food, which in turn gives me so much more energy. This helps me to get through my crazy 15-hour days at the moment. I work full time in a big advertising agency in Dublin 5 days a week, I have college on Tues and Thurs evenings until 9.30pm and all day Sat and I Teach classes in the TRX studios on a Mon, Wens and Friday until 9.30pm. – It’s super cost effective. Contrary to what you might believe, Clean Eating is actually more cost-effective and less expensive than eating pre-packaged food or fast food. For example, for the price of a Super-Sized Big Mac Meal Deal, I could prepare an entire pot of healthy soup that would feed my family for a week, which will be more satisfying and nutritionally dense for them. I work on Baggot street and whilst the variety of lunch spots here is amazing the cost of buying lunch every day can work out at anything up to 35euro a week. By bringing in my own food in to work (Breakfast, lunch and dinners before college) I am saving a fortune by doing a big weekly shop and spending 15mins in the evenings making and prepping my food for the next day. I also know exactly what goes into my food, which to me is worth more than money. – I personally feel like it’s a sustainable way to stay healthy… Unlike fad diets (the many many) that I’ve tried in the past, Clean Eating is an overall positive approach to eating that I believe I can practice for my entire life. You don’t “go on” a Clean Eating diet — you’re always clean eating. – It helps to keep me looking and feeling younger and fresher. . Healthy foods promote healthy cell growth and repair and can help promote good cell growth and can eliminate harmful free radicals and toxins in my body. This results in my skin regaining some of its Natural glow and suppleness, which as I head further into my early thirties is becoming more and more relevant to me. – If you currently have a poor diet then your body will be accustomed to processed foods and may have a difficult time with the natural flavors of real food however your taste buds WILL change. If you start eating this way regularly, you’ll see that eventually, the stuff you used to love just doesn’t taste the same any longer. E.g. I much prefer the taste of dark chocolate to milk chocolate. – You will need to be prepared and be comfortable cooking your own food. I do a weekly shop over the weekend for my fruit and veg, I go to my local butchers for my meat and I go to the health stores whenever I run out of healthy ingredients I can’t get in a supermarket. More and more supermarkets are starting to stock clean versions of food, Tesco sell unsweetened Almond milk, quinoa and Tamari sauce. Supervalu, Dunnes and Spar sell Coconut oil. When I get home from either work or college at 9.30pm in the evenings I throw on my meat, (fish, chicken, steak) in the oven for 25mins, throw my rice, quinoa etc. in a pot on the stove and catch up on that nights Eastenders while they cook. I’ve invested in some good quality tubberware to bring my lunch and diner with me to work most days. My locker and fridge in work is packed full of herbs, and spices and a variety of different foods likes, ryvita, eggs, porridge, peanut butters etc. so should I ever get hungry or not get to make my lunch I always have something healthy to eat. Changing your eating routine is a big step and as it is NOT a Diet so you should approach it one step at a time. I’ve helped lots of my friends, work colleagues and my family to slowly change their eating habits and over time I’ve developed what I call the Clean Eating Starter Pack. These are just some of the ingredients that you can use everyday to begin taking the step to a Healthier happier you. Swap your regular low Fat Skimmed or Full fat milk for Unsweetened Almond Milk. Why? – It’s a good source of the antioxidant vitamin E, so it can help prevent cancer and slow the signs of aging. - The flavonoids found in it help to reduce the number of free radicals in the body, protecting you from a number of degenerative diseases that occur with again, such as osteoporosis and type 2diabetes. – It contains NO Saturated Fat and NO cholesterol so it won’t damage your cardio vascular health.it is also high in omega-3 fatty acids to help lower your levels of “bad” LDL cholesterol and protect your heart. – Almond milk is very low in calories. It contains about three grams of fat per serving, but they’re all healthy fats that help protect your heart and preserve cognitive function. Swap your regular table salt even Sea Salt for Pink Himalayan rock salt. Why? – Many people are unaware that common table salt contains chemicals and even sugar! Salt is necessary but can be dangerous if taken in this chemical form. – Table salt is composed of 97.5% sodium chloride and 2.5% chemicals. Sodium Chloride an unnatural salt the human body actually sees as a toxic invader and The body cannot dispose of it in a natural, healthy way which can lead to irritation of the tissues, water retention and high blood pressure. It is also dried at 1200 degrees Fahrenheit, which kills off all of the nutrients that were originally found in it. – Himalayan salt is over 250 million years old and pure, untouched by many of the toxins and pollutants that pervade other forms of salt including ocean salt due t the fact that is has formed under intense tectonic pressure, creating an environment that has not been exposed to environmental pollutants created by man. 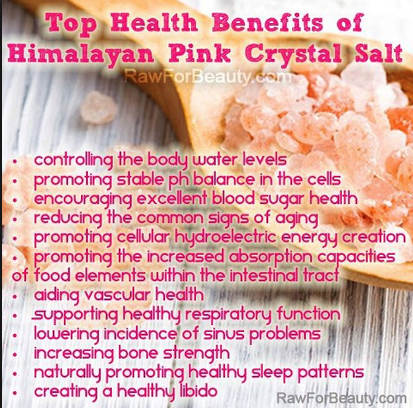 – Pink Salt contains ALL 84 natural minerals and elements found in the human body. In a tiny form that means it is easily absorbed into our body’s cells immediately to begin work. This Unique cellular structure allows it to store vibrational energy. Sea Salt does not have this structure and therefore cannot be broken down as fast without using vital energy to do so. -There are lots of other Health benefits associated with pick salt this picture gives you just a few. Why? – As explained in my post above you need to swap those simple refined sugars that break down fast and cause insulin and blood sugar spikes for complex natural sugars that will sustain energy and blood sugar levels for overall health and the prevention of diseases such as type 2 Diabetes. Swap Soya sauce (even the light version) in your cooking for Tamari sauce. Why? – Nearly All traditional Soya sauces that you use in stir-fry’s including the light versions contain sugar, wheat and excess salt among other things just check the back of the label on the one in your cupboard. Tamari sauce is a healthier alternative to soya, its GLUTEN and SUGAR free, containing: Soya beans, water, sea salt and koji. Tamari has several additional health benefits. Namely, it provides niacin (vitamin B3), manganese, and protein, as well as tryptophan. Tryptophan is an essential amino acid nitrogen balance in adults. It also contributes to the production of serotonin, which is believed to not only aid sleep but also contributed to a more a stable mood. Start stocking your shelves with the following ingredients that will help make each of your meals as nutritious as possible.…until eventually your cupboards and fridges are full to the brim of everything you need. – Organic Nut Butters, like peanut butter & almond butter, make sure that these come from a health store the ones sold in the supermarket contain palm oil which is a bad fat. 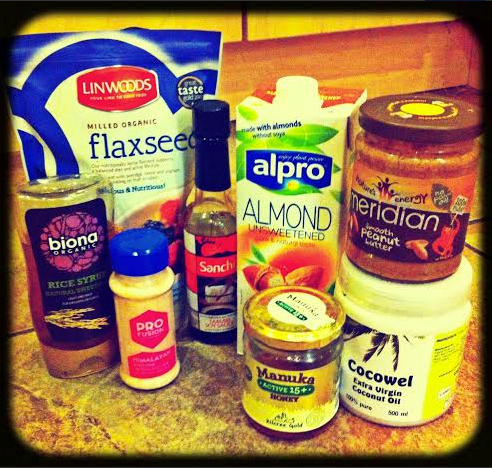 – Flaxseeds added omega 3 to porridges and yogurts, topping for chicken etc. – Manuka Honey is amazing for building your immune system, sore throats, tummy upsets and general well being. – Fresh herbs and spices.. Start building up you spice rack with as many as you can. Start using these natural flavor enhancers in your food instead of E numbers from processed food. – Start with these baby steps and you will start to notice a difference. – Follow my blog http://www.facebook.com/JenniTRX for some daily inspiration and my own personal Clean eating tips and recipes as well as my mentor Steve on www.TRX.ie for my personal Clean eating tips and recipes. I try to give a real life daily account of what it’s like to live a Clean Eating Lifestyle in Dublin whilst working in an office studying at night and working in the studios. In my next piece I will delve deeper into the various foods you should eat and avoid, my shopping list tips give some helpful recipes that I use to keep me Eating clean, from wholesome soups, a variety of dipping sauces and spreads, to yummy treats the whole family can enjoy. Show you how to maintain your healthy Clean Eating lifestyle on holidays and eating out. Loving these blogs, looking forward to the next one already!